Kosovo officially began using its international dialing code - +383 – on Thursday. 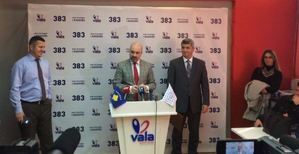 Announcing the momentous occasion, Director of Kosovo Telecoms, Agron Mustafa, demonstrated how calls from Vala mobile operator to phone numbers in Kosovo can be made using the new country code. Kosovo finally obtained its own international dialing code from the International Telecommunication Union, ITU, after Kosovo and Serbia reached a deal on telecoms on December 15, after a year of EU-mediated negotiations. Officials from Kosovo Telecoms said that the three prefixes from other countries that Kosovo has been using up until now - Monaco’s +377, Slovenia’s + 386, and Serbia’s +381 – will no longer work for calling Kosovo numbers by the end of the year. A vice-president of Romania's ruling Social Democrat Party (PSD) called on his party's leadership and government to withdraw a decree decriminalizing some graft offenses, a move that has brought tens of thousands of Romanians out in protest, Reuters reported. 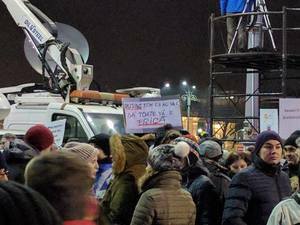 Private television station Digi24 TV quoted Mihai Chirica, also mayor of the northern city of Iasi, as saying he understood protesters' legitimate demands and that he backed them. In its 2016 progress report on Albania, the European Parliament will call on the Balkan country to recognize its Bulgarian minority, Bulgarian MEP Andrey Kovachev announced on his website on Wednesday following a meeting of the Foreign Affairs Committee of the Parliament. Kovachev, who is a member of the European People’s Party, EPP, quoted an amendment to the draft report, approved by the Committee on Wednesday, which recommends that Albania guarantee the rights of people with Bulgarian ethnic origin in the region of Prespa, Golo Bardo and Gora through legislation and in practice. The MEP has also referred to unofficial data, according to which between 50,000 and 100,000 people of Bulgarian ethnic origin live in Albania, which officially recognises three ethnic minorities – Greek, Macedonian and Serb-Montenegrin. MEPs will vote on the progress report on Albania at their next Strasbourg Plenary in February. Serbian Prime Minister Aleksandar Vucic will meet with Serbs leaders from Kosovo at 5pm on Thursday in the southern Serbian town of Raska. Vucic told media earlier in the day that he is not expecting anything from Pristina and that he wants to keep peace and stability in the region. The meeting comes after the highest representatives from Serbia and Kosovo met in Brussels on Wednesday evening for the second round of talks since Serbia sent a train to northern Kosovo covered in nationalist phrases. The final results of the latest talks are yet to be presented to the public, however, Deutsche Welle reported on Thursday morning, quoting an anonymous source, that the dialogue between Belgrade and Pristina is over. Meanwhile, Serbian President Tomislav Nikolic had a series of urgent meetings with the ambassadors of China, Russia and the US in Belgrade on Thursday morning to discuss the situation between Serbia and Kosovo following Wednesday’s meeting in Brussels, Tanjug news agency reported. A vice-president of Romania’s ruling Social Democrat Party and mayor of the northern city of Iasi, Mihai Chirica, has called on the government and his party to withdraw the decree that will relax anti-graft legislation in the country, Reuters reported on Thursday. His call comes after mass protests took place in 50 cities across Romania on Wednesday evening as an estimated 300,000 citizens took to the streets to express their discontent for the decree. Dragging Montenegro into NATO may cause a rift in the country’s society, Russian Deputy Foreign Minister Alexei Meshkov said at a meeting with leaders of Montenegro’s Democratic Front Andrija Mandic and Milan Knezevic, News Front agency reported. According to the Russian Foreign Ministry, Meshkov received the two politicians at their request. Bulgaria’s electoral body, the Central Electoral Commission, CIK, opened the registration process on Thursday for early parliamentary elections, to be held on 26 February. Parties who want to run for election have until February 8 to submit the relevant documents. The first party to register for the early vote was Bulgaria’s largest political group, the centre-right GERB led by ex-Prime Minister Boyko Borissov. Bosnia's prosecutor for Organized Crime, Economic Crime and Corruption has issued an indictment naming 16 people in the case of Bobar Bank. The charges related to financial crimes amounting to more than 100 million Bosnian marks. During his visit to Sarajevo today, NATO secretary general Jens Stoltenberg said the organisation was helping the Western Balkans to resist foreign influence. Saying NATO was aware of reports of the increased influence of Russia in the Western Balkans and particularly Montenegro, Stoltenberg said: "The best way to increase resilience towards any kind of external influence or potential influence is to make sure that the institutions in different Western Balkan countries are strong, modernised and reformed." The Russian foreign ministry has given its support for the formation of a new government in Macedonia between the main ruling VMRO DPMNE and their former partners, the Democratic Union for Integration, DUI, accusing the West of unjust interfering in Macedonia's internal political affairs by "artificially" inducing the December 11 elections using " pseudo-democratic slogans". In a press release, the ministry alleged that the West's goal is obvious, it is "to settle the accounts with undesirable Macedonian politicians for the West" contrary to the popular vote for the ruling parties. Twenty-three people have been arrested in raids as part of a joint operation by Austria, Bulgaria, Croatia, Germany, Hungary and Romania on February 1, aimed at cracking down on the ongoing migrants smuggling activities in these countries. Numerous locations believed to be used as safe houses for irregular migrants were raided, with 19 of the arrests taking place in Romania, two in Hungary and one in Germany and Austria respectively. The police also seized mobile phones, sim cards, 4,000 euros in cash and international train tickets, Europol announced in a press release on Thursday. 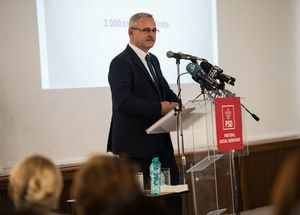 Romania's ruling Social Democrat party leader Liviu Dragnea said on Thursday that Prime Minister Sorin Grindeanu has unanimous backing as premier among senior party members who have gathered to discuss recent domestic political developments. Dragnea told reporters that the government has full backing to continue to exert 'its legitimate powers'. Over 300,000 people protested across Romania on Wednesday night against the decision to relax anti-graft legislation and the European Commission's vice-President has urged the government to reconsider. President of Republika Srpska Milorad Dodik has defended the Bosnian Serb entity's spending on lobbying firms in the US. News agency Fena reports that Dodik responded to revelations published in Voice of America that RS had spent more than $29 million on US lobbying. He said it was possible that the figure was accurate, but that it was not an exorbitant sum given the positive effect it had on the interests of RS. "It is an open secret that in ten years we have contacts with certain agencies and that the good position of the RS in the past is thanks to it," he is reported to have said. My clear message to #Kosovar Serbs: you'll never have to fear Kosovo state. Integration & dialogue worked, violence in north now 90% down. 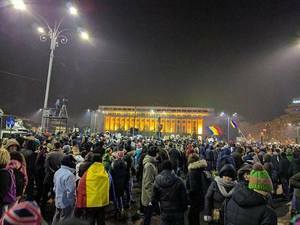 Over 40.000 Romanians are back to the streets of Bucharest on Thursday, for the third night in a row, to protest a move by the Social-Democrat government, in power for less than a month, to relax anti-graft legislation. Romania's government on Thursday rejected calls to withdraw a decree that critics say is a major step back on anti-corruption reforms. resignation of a cabinet minister and a call from a vice-president of the ruling party for dropping the decree. The decree, hastily adopted late on Tuesday, has triggered the biggest nationwide demonstrations since Nicolae Ceausescu's communist rule ended in a popular uprising in 1989. 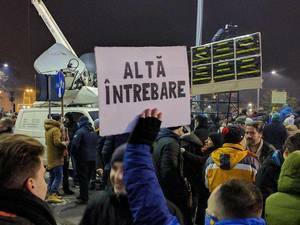 Except for minor incidents that were promptly averted by gendarmes, the protesters stay peaceful; all the roads to Bucharest's Victoria Square have been closed to traffic. Several other protests are underway in Romania's main cities, including Cluj. Protesters started chanting the National Anthem. According to the police, approximately 70,000 protesters have gathered in front of the government building. The demonstrators have been handed out flyers with the National Anthem text. "Another question." Justice Minister Florin Iordache refused over 15 times on Tuesday night to answer journalists' questions by saying "another question". The protesters have been mocking him and the government for lack of transparency. PHOTO: BIRN. The crowd in Bucharest's Victoriei Square is shrinking. Only around 3,000 protesters remain. The organizers, who are using mobile apps like Firechat because the Minister of Interior announced that Facebook is being monitored, are calling for more demonstrations on Friday night and during the weekend. A speech by the new US Secretary of Defense - arguing that Kosovo should be allowed to defend itself - has alarmed Serbia and enlivened the debate in Kosovo on whether it is time to form a regular army. Read more. An online Balkan peace charter started by two journalists from Bosnia and Croatia has attracted several thousand signatures of support - but there has been no response from regional political leaders. Read more. The common belief that Macedonia’s special prosecution has only 18 months to complete its tasks is based on a mistaken understanding of the law. Read the comment piece. Croatian Prime Minister Andrej Plenkovic will take part in an informal meeting of EU leaders today in Malta, where they will discuss the migration issue, specifically the route migrants are taking across the Mediterranean Sea to Europe, and the situation in Libya. 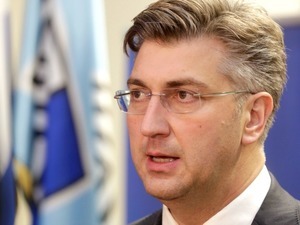 Plenkovic will also meet his Hungarian counterpart Viktor Orban and will discuss the issue surrounding Croatian energy company INA, which Croatia plans to buy-out from Hungarian energy company MOL. During his trip to the Washington to attend US President Donald Trump’s National Prayer Breakfast, Serbian Minister of Foreign Affairs Ivica Dacic invited the new US Secretary of State, Rex Tillerson, to visit Serbia. The foreign minister told media on Friday that he also talked with US senators Ron Johnson, Evan Vickers and Chris Murphy during his visit and that their discussions had focused on challenges in the Balkan region, the current situation between Kosovo and Serbia, and strengthening transatlantic cooperation. Croatian President Kolinda Grabar Kitarovic will travel to Kuwait on Sunday for a two-day visit in which she will meet with the Emir of Kuwait, Sabah Ahmad Al-Jaber Al-Sabah, among other high state representatives and open an embassy in the country. The focus of her visit will be more intensive economic cooperation and trades between the two countries. Yaser Harawi, a 51-year-old Syrian-born doctor who moved to Serbia over 30 years ago, is among those helping Syrian and other migrants in Belgrade on their journeys across the Balkans headed for Western Europe, the Associated Press reported. Harawi’s father, who had his life saved by doctors in Belgrade after suffering a gallbladder blockage while on a work trip in the 1950s to then Yugoslavia, sent him to study medicine in Serbia in 1983 as “a way to thank Serbia and its people,” Harawi told the Associated Press. While initially unhappy with his father’s decision, Harawi stayed in Belgrade - where he met his wife and started a family - and now sees it as a fateful move as he spends hours each day helping migrants from his country of birth and elsewhere who are stranded in the Serbian capital. Croatia's commission on conflicts of interest decided on Friday that it will start a process against Boris Vujcic, the governor of the Croatian National Bank, HNB. Vujcic was reported to the commission by Association Franak, which advocates for the rights of people with loans taken in Swiss Francs, because his trip to a meeting of investors and bankers in the Austrian city of Kitzbuhel in January 2016 was financially covered by the organiser, Italian banking group Unicredit Group, which owns the biggest commercial bank in Croatia, Zagrebacka banka. Although HNB reimbursed the money to Unicredit, Association Franak claims that Vujcic violated HNB's integrity by depending on travel and accommodation costs from a bank operating in Croatia. German police announced they have arrested a 21-year-old Romanian man at Frankfurt airport on suspicion he was preparing a terrorist attack in Germany. The man, who wasn't named, is suspected of engaging in online discussions with Islamists and extremists about organizing an attack. Karlsruhe police said in a statement that the man was arrested Thursday morning as he allegedly planned to travel to Romania to prepare the attack, though there was no indication he had a concrete target. Police said officers seized written notes and electronic storage devices during a search of the man's home, and these were being examined. A judge has ordered the man be kept in detention. NATO Secretary General Jens Stoltenberg reiterated his support for Kosovo Security Forces during his visit in Kosovo on Friday where he held meetings with high state officials. 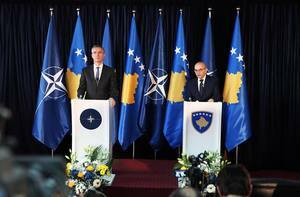 Stoltenberg also said that the agreements that have been reached between Kosovo and Serbia should be implemented, as this is the only solution towards the normalisation process. Croatian President Kolinda Grabar Kitarovic said on Friday while in the southern coastal town of Dubrovnik that it is too early to talk about reintroducing obligatory military service in the country. However, addressing recent discussions on introducing compulsory military training camps to run for short periods over summer, Grabar Kitarovic stated that these "would last for a few weeks during which young men and women would learn how to react in urgent situations." 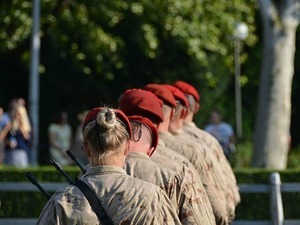 In 2015, President Grabar Kitarovic expressed a desire to reintroduce compulsory military service for a period of eight weeks. Bulgarians will hold a rally in the capital, Sofia, on Sunday in solidarity with ongoing protests in Romania against the government’s decision to relax anti-graft legislation. Bulgarians will demonstrate alongside Romanians living in Bulgaria in what intends to be a peaceful rally outside the Romanian embassy in Sofia. Serbia’s Prime Minister, Aleksandar Vucic, has blamed Kosovo for the breakdown of EU-mediated talks between the two countries, the Associated Press reported on Friday. According to Vucic, the “only goal” of Kosovo’s leaders is to charge into the Serb-dominated north of Kosovo, AP wrote. Vucic’s statement comes after a meeting in Brussels on Wednesday evening with the prime ministers and presidents of Kosovo and Serbia in attendance, which ended abruptly and, according to diplomatic sources, failed to achieve anything. Tensions between the neighbouring countries rapidly escalated in recent weeks after Serbia sent a train to the north of Kosovo covered in nationalistic phrases, and after Kosovo said it would demolish a wall built by Serbs in the ethnically-divided Kosovo city of Mitrovica. 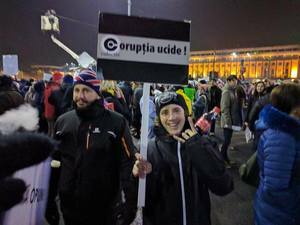 Thousands of Romanians have gathered for the fourth night in a row in front of the government building in Bucharest"s Victoria Square to protest against the social-democrat cabinet's policy to relax anti-corruption legislation. Romanians have protested in 70 cities and towns across Romania on Friday, the riot police said. "Repeal it, repeal it," "Corruption kills,'" read banners carried by demonstrators in Bucharest. In Northern Baia Marea, protesters carried coffins with banners reading "Here lies our democracy. About 120,000 gathered in Bucharest alone, according to riot police, and overall about 300,000 protested around the country and in several western European capitals. Large demonstrations are expected on Saturday and Sunday, including a children's march. The crowd sings Romania's national anthem. There are already 100,000 people in Victoria Square in Bucharest, protesters are still coming but they have to stop on the adjacent boulevards due to the high density of people. Media outlets estimate around 180,000 people took to the streets in several cities: 30,000 in Cluj, 18,000 in Sibiu, 25,000 in Timisoara. The number of protesters reached 80.000, Romanian media outlets report. Gendarmes have arrested a man in Victoria Square, after protesters complained to the police he was being violent. Meanwhile, Romanians gathered in London, despite the rain, and several other capitals in Europe in solidarity with the demonstrations in Romania. Approximately 20.000 protesters have gathered in Bucharest. 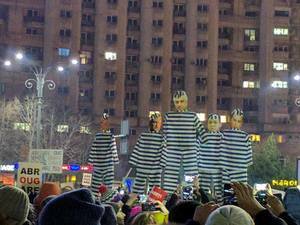 Four giant dolls portraying PSD leader Liviu Dragnea, PM Sorin Grindeanu, former PM Victor Ponta, head of ALDE Calin Popescu Tariceanu and Minister of Justice Florin Iordache all wearing prison uniforms are touring the square. Activists are more organized there a are boxes in the middle of the square where protesters can find banners and they can also write their own messages in a small workshop nearby. Protests have started in several towns and cities across the country, including this small town in Eastern Romania. 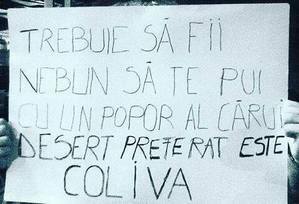 Several Romanian activists have published thank-you memes for Bulgarian activists who announced a protest of solidarity with Romanians on Saturday. 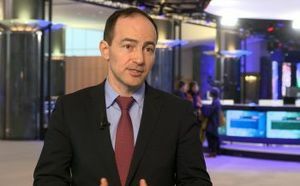 Social democrat MEP Sorin Moisa, deemed one of the most influential Romanians in the European Parliament by Politico, announced his resignation from PSD. "There comes a time when keeping silent is being guilty," he wrote on his Facebook account. "I support the protesters' request to withdraw the emergency decree. It's not only a legitimate request, but also the wisest way out of the crisis, to rebuild the minimal trust that is so necessary at the beginning of any government, and to find as well, eventually, a compromise to work things out."